Promotional mugs can be found in many sizes and shapes and are supplied in glass, ceramic, plastic, metal and a variety of other materials. 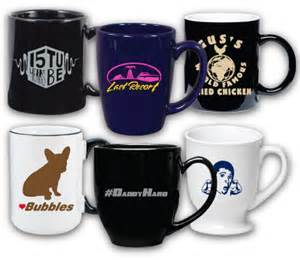 Promotional coffee mugs give an inexpensive yet effective way of marketing your company. There are a huge selection of coffee mugs you can offer to just about any audience. Glass mugs from the conventional pint or coffee designs are highly popular. Corporate mugs can make great gifts if you personalize them correctly. If you 're gifting a gift to a client, take the time, do the research and learn more about the client. You never know, you may have the opportunity to have a personal message imprinted on the mug, or event a picture. Your customer's first impression of your company is easily the one that is most significant! There are plenty of cheap options available, but think outside the box. Everyone loves a free gift. Do a business card draw, take the time to put some thought into the promotion and always be aware that everything you do can be shared and talked about on social media. If you're doing something memorable, make sure you find the ideal promotional style for your own organization. As giveaways and presents, there are more than just mugs to consider. There are a range of drinkware available including items like game bottles. These unique items are not merely cheap but are goods that are welcome. However, you must remember that a frequent buyer will be cost conscious. These promotional products are inevitably observed by a great deal of people and people want value for their money. You never know, your business logo and brand could wind up in your prospective customer's house and become a reminder about your merchandise or services and solutions.